A public smoking ban in Italy has led to a fall in hospital admissions for heart attacks, research suggests. Analysis of the Piedmont region revealed admissions fell by 11% in the first five months of the ban compared with the same period the previous year. Writing in the European Heart Journal, the team said this was probably due to a drop in passive smoking exposure. The Italian government banned smoking in all indoor public places, including cafes, bars and restaurants, in 2005. It joins other countries including Ireland, Norway, South Africa and Sweden, which have enforced such a ban. Smoking is linked to many adverse health effects, including lung cancer, and cardiovascular and respiratory diseases. Scientists from the University of Turin analysed hospital admissions for heart attacks and heart attack deaths for people under the age of 60 throughout the region of Piedmont, northern Italy. They looked at the statistics for the period immediately after the ban came into force - from February to June 2005 - and compared this with the same period the previous year. The team discovered that after the smoking ban there were 832 cases compared with 922 the previous year - a difference of 11%. Dr Francesco Barone-Adesi, the lead researcher from the Cancer Epidemiology Unit at the University of Turin, said: "The rates of acute myocardial infarction (heart attack) had, if anything, been increasing between 2001 and 2004, so the reduction we saw in the first half of 2005 was not attributable to long-term trends. "In fact, as there was evidence that AMI was increasing over time, it's possible that our estimate of an 11% decrease after the introduction of the ban is even an underestimate." The researchers said they suspect this effect was mainly attributable to a reduction in passive smoking. 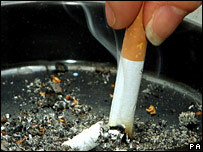 Dr Barone-Adesi said: "Our findings suggest that smoking regulations may have important short-term effects on health." In an accompanying editorial in the same journal, Peter Radke and Heribert Schunkert of the University Hospital of Schleswig-Holstein, Germany, wrote: "Smoking bans have been criticised in the last decade for numerous reasons. "The argument of the 'victimless crime', however, clearly and finally has to leave the discussion based on the accumulating data, including the current article by Barone-Adesi." Ruairi O'Connor, British Heart Foundation (BHF) public affairs manager, said: "While treating the results of this small study with some caution, these encouraging findings show that smoke-free policies may have a significant short-term impact on the incidence of heart attacks. "Successful implementation of smoke-free policies across the UK can't happen soon enough. "Policy makers around the world should follow the lead taken by politicians in countries like Scotland, England, Wales and Northern Ireland and introduce smoke-free policies within their own borders."